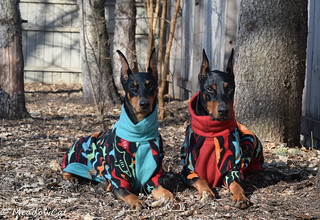 Doberman Forum : Doberman Breed Dog Forums > Doberman Training & Obedience > Obedience, Agility, and Working Sports > Agility: Dog walk! I'm wondering if anyone has any wisdom or past experiences to share as my boy keeps losing his confidence with the dog walk. I'm new to the agility world as is my boy Gunner who is now 15 months. I'm having issues with the dog walk. We have introduced him to it gradually. First at the lowest, likely just a couple of feet off the ground and once he was ok we raised it. He's had 2 falls where he would get scared and we didn't go back to it for a few weeks. Then re-introduce the obstacle and now my trainers have made some blocks for us to gradually build it back up over the course of a few months. I'm also using ledges and objects of similar width for him to do basic obedience on and change direction etc. I've been using cavalettis to help him with foot awareness. I've been using food and positive reinforcement but there is still a degree of nervousness and insecurity when he is on it. After 4 passes on the dog walk the fear seems to go away when we train. When he falls it seems to start with a hind foot then the rest of him goes with it. He slipped off today while I was practicing. It had been a good month since the last fall. We had been building his confidence back 2 inches at a time and he was doing well, not rushing, taking food from me and seemed ok. After this he wouldn't go back on it. Normally my trainers tell me to let it go and just not try the dog walk for a couple of sessions then build up again but today I chose to use a leash and get him back on it. He went back and did it another few times for me. He was nervous though. We ended on a good note but the dog walk still haunts me and him mostly. Is this a young dobe thing. my trainers tell me he will be a bit unsteady in his hind until he is 2. Any ideas? You know what--I think 15 months is too young to be working your dog on obstacles like the dog walk, teeter, a-frame and weaves. One of my early agility dogs fell off a dog walk during a fun day put on at a meeting of the chapter club--the owner of the equipment a trainer and judge was supposed to have had the dog walk very low and didn't do that and then pressured me into getting the puppy on it at almost full height--and then because he was gabbing and not spotting he let my puppy fall off on his side--it took over two years for him to even be willing to get on a dog walk, no matter how low and even though he did get up to masters levels he was never confident or fast on dog walks and sometimes panick midway across in a run and would stop and shake which would make the dog walk feel unstable to him--a couple of times we had to go and lift him off. We worked him on a long board--the width of a standard dog walk for months--it was raised only as high as a couple of cement blocks would put it. We used treats and did not use a leash to try to force him on or along the makeshift low board. And when he finally graduated to a regular dog walk we raised it very slowly. It took ages but we were never able to get him to a point where he was really confident. And this was a dog who learned the A-frame as a Schutzen obstacle (much steeper than AKC or NADAC A-frames by following some shepherd up and down it. The next dog along was fearless and didn't care how many times he fell off the dog walk and took it at a dead fun and fell off frequently but was to determined to run it that when it was still low he'd fall and try to jump back on where he fell off. Different dogs respond very differently to the pitfalls of various obstacles--and generally it's best to go back to step one and start all over again when you have a dog who is clearly fearful. And we learned to not even start training the various obstacles until the males were at least 18 months old. Worked at lot with direction, jumps where the bar was on the floor, the A-frame was practically flat, fake dog walks that were only a board on cement blocks and weaves that were channel types wide open training primarily for propers entry. Thank you so much. Yes I have so many things to work on in tems of jumping basics, which consists of that majority of our training. I will let the dog walk be for a few months then start back again a couple of inches at a time when he is older. I'll use the board at home in the spring. This guy lacks confidence in general, when things go bad it's hard on him. We are working on entry only for the poles with a set of 2. He was doing so well ….it's just hard to see it crumble appart. We practiced again tonight.My trainer came to see how he was and we kept everything light and low key. Just playing and mostly making sure agility was fun for him. We had a good time. We agreed to leave the big obstacles as we work on other things during training, and maybe I can continue to build his confidence in other ways to help him cope with life. A couple of thoughts - even with a confident dog, even starting later in life with a contact like the dog walk - a fall at full height can be VERY traumatic. If you haven't done any reading on "one event learning"...you may want to read up on that. Sometimes things that happen to a dog (or person) can really, really affect them, even if it only happens one time. Yes, it's possible for him to overcome it, and it's also possible that it's always going to be a difficult obstacle for him. It doesn't mean his agility career is over (there are plenty of types of courses that don't have a dog walk in them, so don't despair), but just keep that in mind...the fall and the feeling of being out of control, plus, it may have been quite painful, may have been seared into his brain after one fall. And it sounds like it's happened more than once. Have you had him checked out afterwards by both a vet and potentially a chiropractor? Falling at full height off a dog walk generally requires at least a chiro adjustment - I've seen falls of the dog walk and it's never pretty. Does your instructor teach dogs "how to fall" at low height? Very few of them do...luckily, mine does, because if they don't realize they CAN bail off at low height and land okay, a lot of dogs will fall really hard on their sides or back, and they can have some damage done to them from the fall. I'd get him checked out if you haven't yet. I would also take it SLOW building back up. Let HIM choose to engage with the obstacle or not. Take it at his pace. Don't rush. It might be slow going, and that's okay. These are all excellent points--that dog of mine that fell off an almost full sized dog walk as a six month old puppy because someone wasn't paying attention was one of those who did a full blown side splat--it knocked the wind out of him and scared him to death. And he never really recovered entirely. He did recover enough to get standard titles through advanced but it was so obvious that he wasn't having fun because of his worries about the dog walk we started running him only in jumpers with weaves--he did well there and did have fun. All of the dogs who came after him did learn that bailing off the dog walk was acceptable (some, like the second dog learned it on their own but some had to be actively taught. Great points. Yeah he's had a couple of falls at full height, now. I've had him checked at work but we didn't take rads or anything as the vet didn't see (he didn't show) anything on the physical exam. I am a vet tech but that doesn't make me an expert at anything. Our vets don't ever talk about chiropractors but that might be something I should look into. My trainer noticed this weekend that he seemed stiffer going to the left. My boy Gunner is not a very confident dog, I've put a lot of hours in training just to gain confidence and trust. I will take my time. We have gone back to the agility facility a couple of times since my OP just to have fun and for class on Sunday. We are doing jumps and the tunnel. He seemed happy again. I see the value now in teaching how to fall off or bailing before things get bad. My trainers don't teach it (or havent to me). I'll try to find more info on it. Thanks MeadowCat and Dobebug I value your comments.